Welcome to our guide to the Bernedoodle. The Bernedoodle is a mix of two different breeds, the Bernese Mountain Dog and the Poodle. We have a wonderful interview with our friend Laura Koch, owner of Petit Jean Puppies an expert on Bernedoodles. Can you tell us who you are and whereabouts you are based? Laura Koch, owner of Petit Jean Puppies in Oppelo Arkansas. Breeder since 1998. USDA licensed and parents health tested with Orthopedic Foundation for Animals and DNA genetic diseases with PawPrint Genetics and Embark. We would love to know your story of how your association with the Bernedoodle began? Our first association with mix breeding was in 2000 with the goldendoodle and we have always loved the Bernese Mountain Dog and have started breeding the Bernedoodles in first generation and now mostly multi-generational lines since 2012. What are the most important thing to know about the Bernedoodle breed? The best thing about the Bernedoodle breed is we are improving the purebred Bernese and making offspring, low to non shed as well as dramatically increasing longevity! Bernese are amazing dogs that are very loyal and people pleasing dogs. The poodle adds that wonderful soft coat and even more intelligence to the breed. So exciting to be on the forefront of this breed. There are different generations and sizes. The first cross is called an F1 which is half purebred bernese mountain dog and half purebred poodle (usually a standard size poodle). The crossback is called an F1b which is the F1 bred back to a purebred poodle (any size). This is the 2nd generation that will prevent shedding coats. Coat testing is important part of any responsible breeding program. The further we get into the generations, the more predictable the offspring will be on size and coats. An F1 bred to an F1b is considered an F2b. Any size of poodle can be introduced, ideally only going half as small as you down size, to prevent abnormal body compositions. Artificial Insemination is often used. Usually any breeding past an F3 is considered a multigenerational breeding. It is very important that the breeder NOT use related lines, as this is the main reason for hybrid breeding, NOT to inbreed. Why choose a Bernedoodle when there are so many choices of breeds possible? You have to love the big dog bernese personality to understand the reason to love a bernedoodle. If you want unique and rare, this is the breed for you. They make wonderful family companions. What type of temperament does the breed have? Fun loving, cuddly, attentive breed that takes to their family like no other. Loyal people pleasing breed that thrives on just praise! They can adapt to almost any lifestyle but do prefer the active families that love to hike and walk, run and play outside. 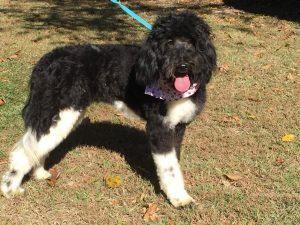 Any health issues unique to the Bernedoodle breed? Bernedoodles can be prone to a couple of health issues, this is why it is important to adopt from a breeder that does health testing and does their best with every litter to breed out these inheritable diseases such as degenerative myelopathy that is fairly dominate in the bernese mountain dogs. Hip dysplasia is very common in any large boned heavy dogs, so hip x rays and certification are important part of producing healthy pups. To rule out DM, DNA genetic testing can always let you know what the parents carry and the right combination of parents is crucial to not pair up two dogs that both carry these debilitation conditions. DNA genetic testing is easy and consulting with a genetic counselor helps to better the lines. How is the Bernedoodle with children? Bernedoodles love children and can be trained to not jump and will be a great addition to any family with well behaved children. There are all sizes of bernedoodles, so be prepared to ask the sizes of the parents. They can range from Toy size to over 100lb. Do your research and decide what would work best for your family. Size can be a factor with space and large crates or a full couch size dog, so make sure to understand the larger dogs will need more space and room to run and play. How does the Bernedoodle get along with other (existing) pets and do you have any tips or advice for new Bernedoodle owners in terms of successful integration? As with getting any new pet, slowly introduce the new puppy to your existing dog. The best idea is to do this at the vet’s office or an unfamiliar place to your older dog so they do not feel threatened immediately to a new puppy in their home. When you get home, make sure to crate the pup so your other dog can safely explore the sound and smell of the new baby. With the proper integration, bernedoodles get along great with other dogs and love the canine companionship! The DogExperts.info website aims to ask questions to breeders, vets and experienced owners to get the answers to your most frequently asked questions about the Bernedoodle breed of dog. We would love to feature your dog and publish any photos or pictures of your Bernedoodle you would like to email us. Are you looking to buy a Bernedoodle – then see our list of Bernedoodle breeders. What type of owners buy a Bernedoodle? What in your opinion are the best things about the Bernedoodle breed? Why do you think the Bernedoodle is special? What are your favourite things about the Bernedoodle? Are you glad you choose to buy a Bernedoodle and not another breed? How would you describe the Bernedoodle temperament? What advice might you give to people thinking about whether they should buy a Bernedoodle over other breeds? What are the history and origins of the Bernedoodle? What colors of Bernedoodle are most popular? What does the Bernedoodle look like? What are the pros/cons of the Bernedoodle breed? What can a new owner expect in terms of differences between the Bernedoodle and other breeds? What type of typical personality does the Bernedoodle have? Is it possible to describe a fairly typical Bernedoodle? What is the breed standard/description for the Bernedoodle? Are there any downsides to owning a Bernedoodle that prospective owners should be aware of? Is the Bernedoodle breed of dog suitable for first-time dog owners? Some breeds can be described as greedy and prone to weight issues, would this apply to the Bernedoodle? Is the Bernedoodle breed suitable for a person or family that are out at work all day? Some owners seek a breed suitable for barking and offering a guard dog role – how does the Bernedoodle match up to that role? Are there myths about the Bernedoodle – in other words do new potential owners come to you with misconceptions about this breed? What types of questions do you get once owners get their Bernedoodle home? What is the typical temperament of a Bernedoodle, so people know what to expect from their new pet? When fully grown how much on average does a Bernedoodle weigh? When the Bernedoodle is full grown in size what is the maximum height and length expected to be? Is the Bernedoodle ever crossed or mixed with other breeds of dog? Does the Bernedoodle smell or drool a lot? Do you have a Bernedoodle growth chart? What breed group does the Bernedoodle come under? Are there some types of people that you can suggest the Bernedoodle is not suitable for, perhaps families? Is it better to buy one Bernedoodle or two? Would the Bernedoodle be suitable as a guard dog? Can I leave my Bernedoodle during the day while I go to work? What is the expected average lifespan of the Bernedoodle? In terms of life expectancy, how long on average would the Bernedoodle breed live to? How to handle the Bernedoodle puppy to start off – how much food, what type, how often? Do owners need to consider supplements for their Bernedoodle? How much did your Bernedoodle cost to buy? Can you offer advice to people looking to buy a Bernedoodle and how much should they spend? What advice would you offer new Bernedoodle owners? What types of people are buying the Bernedoodle and why? Where can I buy Bernedoodle rescue dogs or find a Bernedoodle for adoption? Please note that buying or searching for a ‘cheap’ Bernedoodle can be false economy as they may have health issues that cost you far more in the long-term – always buy from a good and responsible breeder! How would you describe the Bernedoodle puppy to potential new owners? What types of owners are best suited to owning a Bernedoodle? What inspired you to become a breeder and did you start with the Bernedoodle? As a Bernedoodle breed expert, are there any ‘essential’ tips you would like to share with new owners? How long does it take to housetrain/potty train a Bernedoodle? We invite you to email us your Bernedoodle’s pictures, in particular we are looking for photos showing Bernedoodle puppies at 1, 2, 3, 4, 5, 6, 7, 8, 9, 10, 11 and 12 weeks old as well as early pictures such as 1, 2, 3, 4, 5, 6, 7, 8, 9, 10 and 11 months old to a year old. Do they have any nicknames or does the Bernedoodle have popular names? If my Bernedoodle is pregnant what might the litter size be? Could the Bernedoodle be dangerous around young children? How do you prevent a Bernedoodle biting? How do you prevent a Bernedoodle chewing? How do you stop a Bernedoodle jumping up? Does the Bernedoodle have an issue with excessive digging? Why does my Bernedoodle keep growling and barking? Is there a reason my Bernedoodle dog is often scratching excessively? In comparison perhaps to other breeds what can you say about the Bernedoodle and their exercise needs and do you have any tips or advice for new Bernedoodle owners? As a breeder of the Bernedoodle , do you prefer a collar or harness? As an expert of the Bernedoodle breed do you prefer a standard leash or retractable? Can you offer any dog walking tips for Bernedoodle owners? What games and toys can you recommend for the Bernedoodle? How intelligent is the Bernedoodle compared to other dog breeds? Do you have any special grooming routines or tips and advice for new Bernedoodle owners? What accessories are required to be purchased for grooming a Bernedoodle? How much do Bernedoodle shed and how do I maintain their hair and how often? Is the Bernedoodle a hypoallergenic breed? Any advice/tips you can give concerning cleaning and bathing your Bernedoodle? Can you offer new Bernedoodle owners advice concerning fleas and maybe products you use in treatment and prevention? What advice and tips could you offer to owners who might wish to follow your path in showing the Bernedoodle? What started your interest in showing the Bernedoodle? If a new owner perhaps wanted to meet other owners or find out more – perhaps they have an interest in joining a local club or maybe they wonder how they can start showing their Bernedoodle – where would they begin? 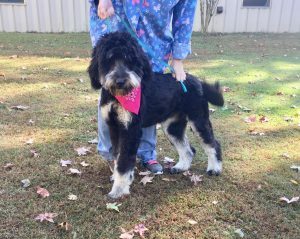 How would an owner know they have a show-quality Bernedoodle and how would they start off? What official organisations are there for the new Bernedoodle owner and what benefits or services do they provide? In buying a Bernedoodle, can you offer advice and tips to new owners? How did you progress to becoming a breeder and why focus on breeding the Bernedoodle out of all the breeds you could have chosen? What do you think makes the Bernedoodle special to you? In comparison perhaps to other breeds what is it like to train a Bernedoodle and do you have any tips or advice for new Bernedoodle owners? How should new owners approach bringing a new Bernedoodle home, any advice and tips you can give? Should I allow my Bernedoodle to sleep in my bed or elsewhere in the house? 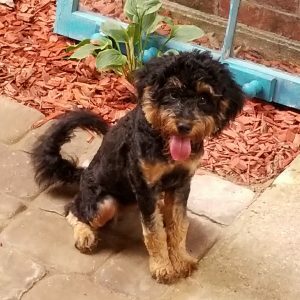 Should my Bernedoodle sleep in a kennel or crate? Health is always a major concern when buying a dog, do you have any advice for new Bernedoodle owners to be aware of in particular? What is the recommended schedule for vaccinations for your Bernedoodle? What type of health issues can a Bernedoodle have and how do you deal with preventing these? Why does my Bernedoodle have diarrhea? Why is my Bernedoodle vomiting and do I go to the vets? When should I take my Bernedoodle for vaccinations and which ones do they need and how often? How often will my Bernedoodle be in heat? 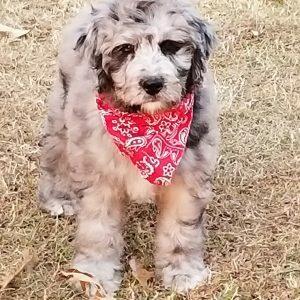 Should I consider getting my Bernedoodle spayed or neutered and when and how much does this cost and what are the benefits? 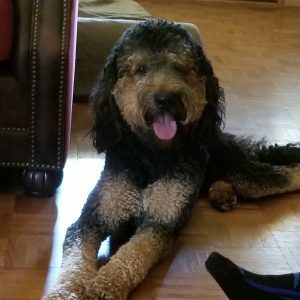 My Bernedoodle is limping, what should I do and should I go to a veterinarian surgeon? Why is my Bernedoodle not eating? How much does it cost to insure my Bernedoodle? What healthcare issues or diseases might be excluded from companies that provide Bernedoodle dog health insurance? What age would you class as an ‘older or senior’ Bernedoodle? What changes in food and diet would you suggest making for an older Bernedoodle? Do you feed any supplements to an older Bernedoodle – or anything else which helps them as they age? Are there any health issues particular to a senior Bernedoodle dog? Do you have any advice for owners of an older/senior Bernedoodle or tips you can pass on? Here is an interesting video on the Bernedoodle.